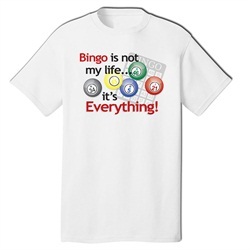 "Bingo is not my life… It's Everything!" This is a Bingoshop only T-shirt. It is a Gildan 50/50, which is 50% cotton and 50% polyester. It stretches a little and remains comfortable, while lasting a long time. The image is not a cheap transfer, instead we went through the process of screen printing. This one has bingo balls and a bingo card with the aforementioned phrase. You will not get this shirt anywhere else!